Whether it’s renovating our nation’s airports, providing vital community hubs for healthcare and education services or delivering innovative infrastructure that makes our daily lives easier, design-build’s impact on our nation has never been larger than today. One look at the impressive winning projects chosen as this year’s Design-Build Institute of America’s Merit Award winners provides a glimpse at the power of collaboration and innovation design-build delivers to our communities from coast to coast. I-64 Capacity Improvements Segment I, Newport New, Virginia. DBIA is proud to honor our nation’s best projects and teams each year with National Design-build awards and is especially thankful to the DBIA awards jury of industry leaders who invest weeks of research and two full days of judging to choose the best of the best in design-build. 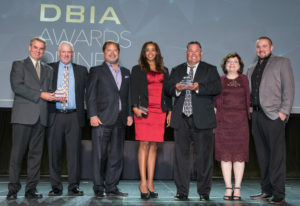 Wonder what it takes to win a DBIA National Design-Build Project/Team Award? DBIA’s Award jury Chair Barbara Jackson from the University of Denver and long-time juror, Ron Lansky with the PENTA Building Group in Nevada, talk about what it takes to win a DBIA National Design-build award in this episode of our Design-Build Delivers podcast. So, are you ready to enter your project for a 2019 award? You can start that process today by adding your project to the National Design-build Projects Database. That’s the first step and you can do that any time online. So, why wait? Get a head start on next year’s awards process while also getting national attention year-round in the DBIA database.